Flashy talk show host David Frost arranges a series of interviews with former President Nixon shortly after his resignation from the presidency. Frost has set up this interview at a great personal expense, though many think he is the wrong man for the job. A movie about a series of interviews? Sounds boring as hell. 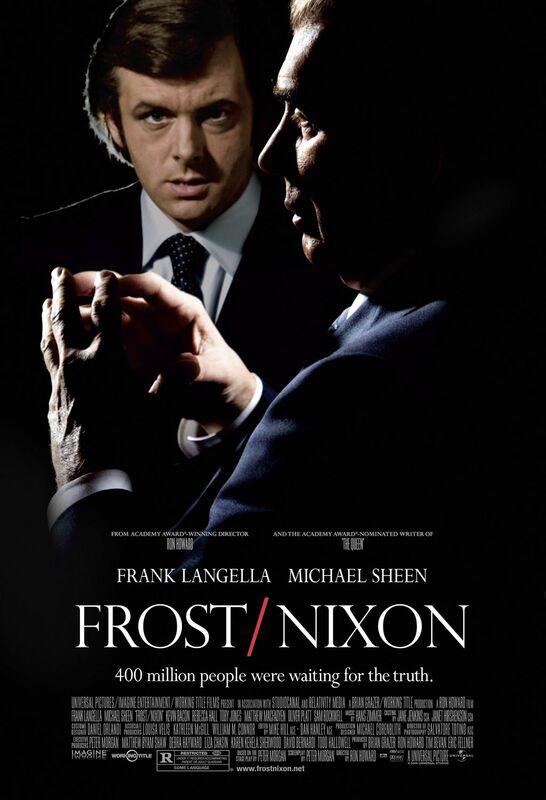 Luckily, "Frost/Nixon" is anything but a snoozefest. This film is made by seasoned director Ron Howard, who has directed numerous award-winning and nominated films like "Apollo 13," "A Beautiful Mind," and "Cinderella Man." It is written Peter Morgan and is based on his own stage play. It stars Michael Sheen and Frank Langella as the unlikely titular duo of David Frost and Richard Nixon. The film is about the lead-up and execution of David Frost's now historic interview with former president Nixon. At the time, Frost was considered a bit of a clown. Everyone said he was the wrong man for the monumental job of taking Richard Nixon to task and putting him in the hot seat post-Watergate, post-resignation, and post-pardon from Gerald Ford. Most people thought Frost would never be able to conduct the hard-hitting interview the people of the United States deserved to see, but he was determined to prove everybody wrong...while also getting huge ratings in the process. On the surface, "Frost/Nixon" looks very obvious, like it will simply be a not-too-riveting average movie about a news interview. The actual meeting between Frost and Nixon was one of major historical significance, so when you combine a recreation of this moment with some really fantastic performances, it becomes something greater, something both compelling and timeless. In many ways, this is a classic underdog story. David Frost, a man wildly unqualified for such a lofty task, must silence the critics who say he is in over his head and must prove wrong the people who told him he should have left the interview to a "real journalist." Frost must overcome insurmountable odds and attempt to get the facts about the once most powerful man in the world and hold his feet to the fire about subjects of the utmost importance to the American people. Michael Sheen has a tremendous charisma on screen and is amazing as David Frost. He does a wonderful job exploring a man who puts on a devil-may-care facade but deep down is struggling with the task in front of him that could ruin his career if he fails. On the other side of the coin, we have the titan, the undisputed champ, a former president who has decades of experience doing interviews and giving speeches. For such an occasion, it's Nixon's job to prepare, deny, and stall Frost's onslaught, and prepare, deny and stall he shall. Frank Langella is brilliant as Richard Nixon and captures the essence of the man without hamming it up too much (which would have been easy to do considering he was playing Richard freakin' Nixon). Langella earned an Oscar nomination for his performance in this film and it was much deserved. We honestly think his portrayal should have earned him the win. These two powerhouse performances are fantastic, but we must not forget the great supporting cast including Matthew Macfadyen, Kevin Bacon, Sam Rockwell, Oliver Platt, and Rebecca Hall. All of these actors add their own style to this fascinating true-life event. Couple the acting with Ron Howard's expert directing and the biting, important screenplay and you've got one hell of a compelling story. We love "Frost/Nixon" and think it has aged well in a decade, especially considering our current political climate.